What gorgeous colors! I don't think I've ever seen that type, but maybe it is only a gulf-area type butterfly! Such happy colors! Gorgeous captures, Deb. 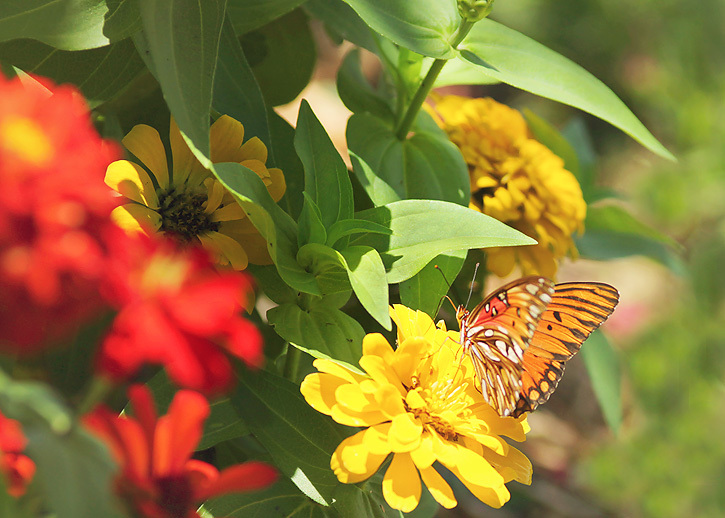 Gorgeous butterfly photos Deb, the perfect colour against your lovely zinnias. Beautiful! Love the brightness of the colors and the clarity of the butterfly's wings. Have a great day, Deb! 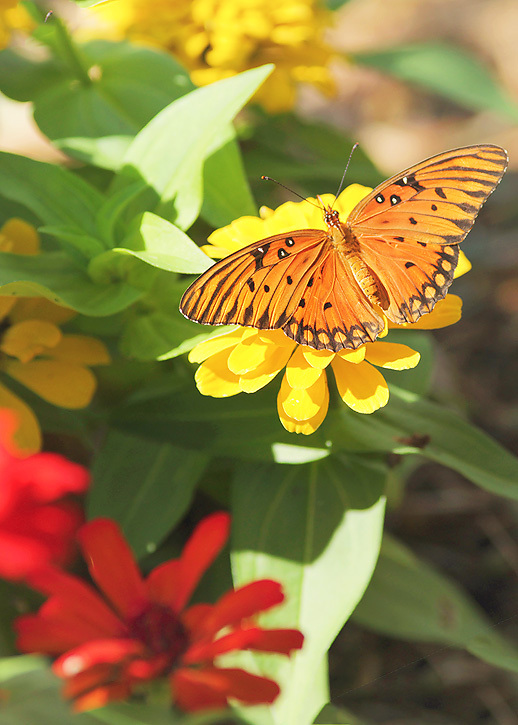 You always take the best flower and butterfly shots Deb! Love em! What lovely butterfly shots...I get so excited if I happen to see one, but usually don't have much luck with capturing a clear photo. These are gorgeous - thank you for sharing! Great shots of the lovely butterfly deb! Oh how lovely these are. Peaceful! I was just looking through your last post too. WOW- how the boys have grown & matured since those shots in '08 & even just last year. Amazing how fast it happens. She must have know you were a mother to butterfly triplets! How gorgeous are these photo! And his colors go so well with your flowers! Such pretty butterflies. I've tried to link up, I don't see my thumbnail, but it says my link all ready exists? Can you help? Amazing color and details in these shots! Beautiful! 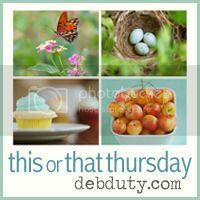 I love your butterfly shots, Deb! Wow, what a beauty! I love the images your captured. So vivid and pretty!! Love all those gorgeous colors!! Wow, I never realized how different butterfly wings can be on the two sides (under and over) - that second photo really highlights the difference in the pattern. Gorgeous shots! You have captured some amazing butterfly photos this summer. how did you get that butterfly to sit still so long?! Come follow me and I will follow you too! These photos are stunning! I love the colors in them, they're so vibrant. Beautiful! I've never seen one of those before. Your photos are gorgeous as always! And I love the new blog design! Wow, these are gorgeous! You always nail the vibrant colors! Deb, I love that first shot. You really do capture these beautiful creatures so well. Oh how pretty! I especially love that first shot. What a beautiful butterfly, and you captured it so well! Newest GFC follower. Happy that I found your beautiful blog. Deb - your butterfly is wonderful!! preciosas imágenes, muy bonitas! !Muy bueno tu blog!.Saludos desde Argentina.